Home runs by Mike Napoli and David Ortiz (pictured) backed seven strong innings by Wade Miley as the Red Sox beat the Texas Rangers 4-3 on Tuesday night at Fenway Park. Boston scored first in their half of the opening frame on an RBI single by Ortiz that drove in Dustin Pedroia. Napoli hit a solo home run to left in the bottom of the fourth and Ortiz followed with his sixth home run of the year in the fifth. Miley held the Rangers to a pair of runs on seven hits and a walk while striking out seven. His record improved to 3-4 and his ERA dropped to 5.10. Hanley Ramirez had three hits for the Red Sox. Mookie Betts, Pedroia, Ortiz and Napoli each had two. Koji Uehara came on in the ninth and earned his 10th save of the year. He allowed a solo home run to Leonys Martin. 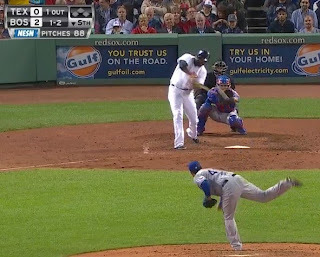 Pablo Sandoval left the game in the seventh inning after being hit by a pitch on his left knee.